No doubt, the same is true for the iPad line. If the iPad Air was the only, full-size form factor going forward, it would just be called the iPad. There would be no reason to apply a differentiating suffix. Therefore, it is logical to assume that sits in the slot just below an, as of yet, unannounced, iPad Pro of some sort. By their naming convention, Apple is practically begging us to come to that conclusion. Let us oblige by considering what such an iPad my be like. For months, I have been reading rumors of Apple building a 12" or 13" iPad. I am not going to link to any of them, as most are just echoes of a single source, and not the most reliable one, at that. Still, I believe the rumor. The first thing to remember is that Apple is always working on everything, especially the stuff they have publicly dismissed. They have likely had touchscreen iMacs in the labs for years. Of course, Jony Ive is walking around with a 6" iPhone. Apple tries everything, and says no to most of it. At some point in the creative process, a design goes from brainstorming, to interesting, to mockup, to prototype. At the prototype stage, they're going to need a few parts from their suppliers. The moment Apple places a special order for two dozen touchscreens with a nonstandard size and resolution, someone is going to hear about it, and leak the information to the highest bidder. The rumors make me believe that Apple is definitely interested in a large form, hi-res iPad. I still think the best indication of this is the existence of the iPad Air. 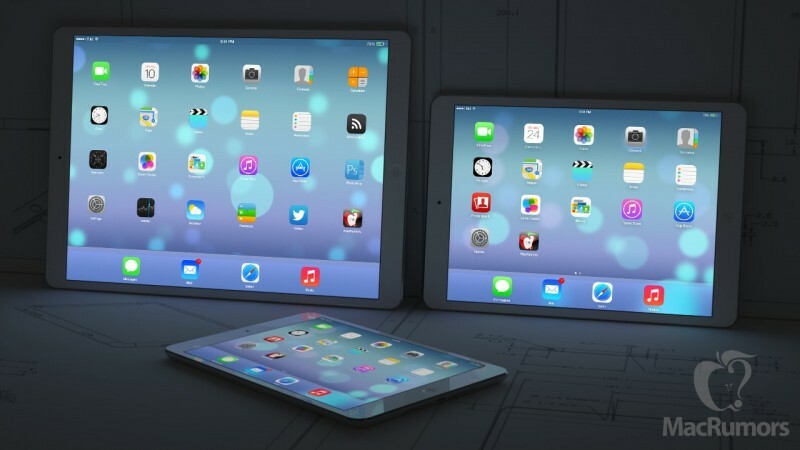 The rumor, however, gives us our first hint of what to expect from an iPad Pro. I cannot think of any professional applications that do better on a smaller screen. That does not mean that professional work cannot be done on the iPad. On the contrary, I do it all the time. But there is no productive work I do on the iPad that wouldn't benefit from an even bigger screen. In my non-iPad life, I use a 27" monitor, and would go even bigger if I could. Larger print and higher information density equals greater productivity. The downside is that such a device would be bigger and heavier than the biggest and heaviest iPad that has come before. Yet I believe that the size issue is overblown to some extent. As always, it is a matter of perspective and expectation. A few years ago, people were walking around with 17" MacBook Pros. They were among the smallest and lightest of the luggables. 13" and 15" notebooks are standard. Weight ranges from 4 to 8 lbs. A MacBook Air weighs about 3 lbs. An iPad Pro with keyboard would likely weigh significantly less, and be just as small. As a tablet, it might be a little big. As a notebook replacement, it will be just right. One of the biggest differences between the iPad and a Windows tablet is that an iPad is made to be used without a keyboard, though, a keyboard can add to the experience. A Windows tablet was not intended to be without a keyboard, and is less without it. You will not see a Surface advertised without a keyboard, yet no keyboard comes with the product. The Touch and Type Covers are $100 + add-ons. Apple designed a sold a keyboard for the iPad in the early days. It was a bad design, not a bad idea. I believe that the iPad Pro will have an optional keyboard intended to compliment the design of the tablet. I also believe that given the bigger screen, a keyboard will be less necessary than ever. That will not stop me from buying one. Bigger, high-density screen, optional keyboard, is this an iPad, or the iBook reborn? Perhaps Apple really does have no plans for putting Mac OS on a touchscreen. But what if they went the other way around? What if they put iOS on a notebook. Boom! That is the end of the Chromebook initiative from Google. The day of that announcement is the day my MacBook Air goes up for sale. I love OS X. But I would much rather be running iOS. In that, I am most certainly not alone. iOS is already made for the touchscreen. It is much easier to add keyboard support to a touch OS, than to add touch support to a keyboard and mouse OS. Apple already has the hardest part done. The number of apps for iOS dwarf that of Mac OS. There is no downside, except to Mac sales. Apple would much rather cannibalize their own business than let someone else do it for them.